This is my card for the Saturday Paper Ala Mode challenge over at The Outlawz. They used an inspiration picture for the challenge this week. For this card, I used the Pitcher & Basin set from Doodle Pantry. I printed the pitcher and basin on heavy weight white card stock and colored it using Copic markers (B32, B34, B41 and B91). The triangle doily is a cut file from Silhouette of America. I hand cut the pitcher and basin and popped it up on the doily. The designer paper and sentiment are also from the Pitcher & Basin set. I mounted the designer paper on black card stock and then placed it on a white card stock base. Susan this is beautiful! I absolutely adore the doily you cut. Really stunning. Gorgeous Susan, vintage, gorgeous colouring and just lovely! Beautiful CAS card....it pops and says a lot with the CAS style and colors you chose. I need to go find that cut file at Silhouette....absolutely lovely!!! What a beautiful card...love that doily too. And, I totally agree. Indoor plumbing is indeed something to be thankful for. Gorgeous coloring, Susan! Love that doily ! Susan...I sure hope one day I can color as good as you! This is wonderful! This sentiment made me laugh! Your card is beautiful!! Your coloring is wonderful! Wow that black die cut really sets off the image so beautifully!! Cute sentiment! Very pretty card. Love the die cut. Thanks for joining us at FOSTV. Love your card - the sentiment made me smile! Thanks for joining the FOSTV inspiration challenge. Wow Susan, this is gorgeous! Your coloring is beautiful and I love that doily. I am still begging DH for a Silhouette....looks like a long wait b/c my birthday isn't until Dec! love this its so elegant! Thanks for joining FOSTV this week! Been looking around...admiring all of it. Wow! What a stunning card, Susan. Love the black, white and blue coloring. That sentiment is a hoot with that image. Gorgeous card! Elegant simplicity as its best, Susan. Beautiful die cut and gorgeous coloring of the pitcher and basin. Adorable Card! I love the saying! You colored it wonderfully! I am your newest follower! BEAUTIFUL and love the coloring with the shading. Love the die cut too. So happy to have you on the DT. 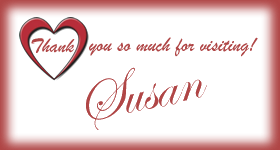 Beautiful card susan. Such a nice pattern paper and the image is so nice. Thanks for your comment on my blog and i am happy to follow you back. Wow, this is stunning. I even like the pp. Funny, never thought I would like digital images or pattern paper, but, seeing YOUR work, I love it!! Of course, your talent for colors, coloring, and lay-out design doesn't come with the image. LOL This is so pretty. AND, I agree, Thank Heavens, OMGosh, can you imagine no indoor plumbing. I can't.........LOL Such gorgeous images and pp, and your wonderful talent makes for a spectacular card! Thanks for sharing. How funny! I love the comedy of your sentiment with the elegance of the basin and pitcher! Congrats on your MFP win. I hope you are able to play along with this week's challenge too!